Train services are operated by the Caledonian Railway. For details of services please click the CR logo above. The B.R.P.S. was formed in February 1979 by local railway enthusiasts, when the Kinnaber Jcn. 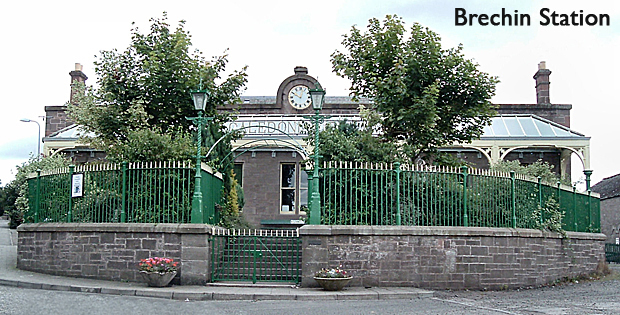 - Brechin line was still in use by B.R. for freight traffic. It was felt that the four mile section between Brechin and Bridge of Dun had all the makings of a Classic preserved railway, which, after thirteen years of hard work, proved to be true. The first locomotive arrived in June 1979, building up over the years to no less than five steam locos, ten diesels, fifteen coaches and over sixty wagons. The members of the Society are drawn from all walks of life, tradesmen, public service workers, professionals, ex-BR. employees and privatised railway employees, and, lastly if not least, retired members of society. Indeed the major part of the coach restoration gang are, senior citizens. All working on a voluntary basis for the good of the Caledonian Railway. Being a member does not mean that you have to come down and get your hands dirty, you can support us from home. Most Preservation Societies have only around 10% of their membership involved in running their railway, for ourselves at Brechin we have about 15% [roughly 30 volunteers] involved. Three free journeys per year, on normal services on the Caledonian Railway on production of a valid Membership card. This concession does not apply on any Special Event services. You will also receive our Newsletter “Caley Lines” by email. The Society also organises an annual Christmas party, which has proved very popular. A discount on insurance premiums quoted by a Montrose Insurance Broker. Re-roof the main store building at Brechin. Restore the Society’s BSK coach. Paint and restore the 1951 Scammell Scarab. Generally maintain Bridge of Dun station. Raise funds for the new station building at Bridge of Dun. Replace the frontage/door to the Society's garage/workshop. Please be aware before visiting that in the interests of safety and security, we do not allow access to the railway's repair/maintenance or storage sheds. Please be sure to stay on platforms and public areas. Caledonian Railway Brechin Limited reserves the right to alter, curtail or suspend any service without notice or change motive power.